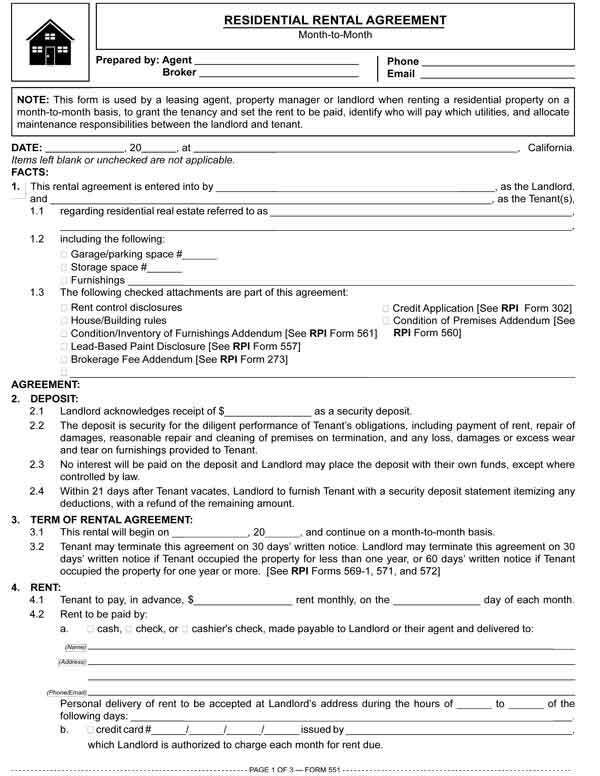 This form is used by a leasing agent, property manager or landlord when renting a residential property on a month-to-month basis, to grant the tenancy and set the rent to be paid, identify who will pay which utilities, and allocate maintenance responsibilities between the landlord and tenant. Both residential rental and lease agreements grant and impose on the landlords and tenants the same basic rights and obligations. Their differences lie in the expectation of continued occupancy and the obligation to pay future rent. Realty Publication, Inc.’s (RPI’s) Residential Rental Agreement is used by a leasing agent, property manager or landlord when renting a residential property on a month-to-month basis, to grant the tenancy and set the rent to be paid, identify who will pay which utilities, and allocate maintenance responsibilities between the landlord and tenant. This provides notice to the landlord of the identity of all individuals who will be occupying the property. Tenant agrees the premises, fixtures, appliances, furnishings and smoke and carbon monoxide detectors are in satisfactory and sanitary condition, except as noted in an addendum. To routinely check and properly maintain smoke and carbon monoxide detectors. To temporarily vacate the premises if required for necessary fumigation or other maintenance. Tenant is entitled to a per diem credit for each day the property is vacated due to maintenance. 8.1 If the premises are totally or partially destroyed and uninhabitable, either Landlord or Tenant may terminate the lease upon written notice. a. If the lease is not terminated, Landlord will repair the premises and rent will be prorated based on a 30-day month for the period the premises was uninhabitable. 6.3 To keep the premises clean, well ventilated, free of mold contaminating moisture buildup and sanitary. a. Tenant to promptly notify Landlord of unabated moisture buildup in the premises for prevention of mold contamination. All shelter has mold spores. If moisture accumulates for a sufficient period of time, mold will propagate resulting in a mold contamination condition. The changes to this form reference the need for tenant observance of moisture buildup and notice to the landlord before the landlord becomes obligated to respond and take steps to cure the problem, regardless of whether the tenant or the landlord is responsible for the presence of the moisture. Real Estate Property Management Chapter 50: Residential rental and lease agreements. Real Estate Property Management Chapter 22: Changing terms on a month-to-month tenancy. Real Estate Property Management Chapter 53: Permitting pets and waterbeds. Real Estate Property Management Chapter 54: Civil rights and Fair Housing laws. Real Estate Property Management Chapter 57: Residential rent control. Is ther a form for a rentals agreement for commercial property when lease is less then 1 year? Thank you for your inquiry! A Commercial Lease Agreement (See RPI Form 552) may be used for establishing leases of less than one year for commercial properties. A Commercial Rental Agreement (See RPI Form 552-5) may also be used to establish a month-to-month rental of commercial property. Please visit our Forms Download page to select the form most specific to your needs. Search “552” for all forms related to commercial lease and rental agreements. What form or forms should a resident homeowner use if he or she wishes to rent a room to a boarder within said residence. A homeowner may use a Residential Rental Agreement (above) for a month-to-month tenancy or a Residential Lease Agreement (RPI Form 550) for a specified term of tenancy. Either form is suitable for establishing the rental of a room within the homeowner’s residence.